I have decided to apply for a position on the Kaisercraft Design team. This post is my submission. I had to provide at least 8 projects made using Kaisercraft supplies. I use Kaisercraft products all the time so it was hard to choose just 8 to share. 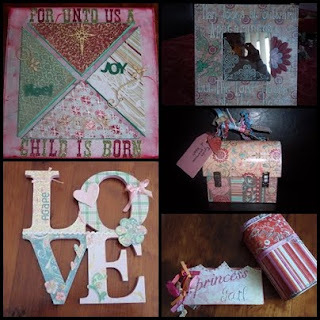 So here are some of my favourite items that I have made over the years, including projects for Scrap of Faith and retreat classes I have taught. 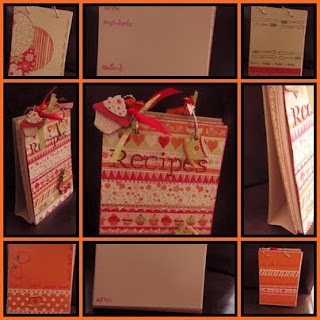 Free Standing Recipe Journal designed as a class at the 2011 Scrapping with Soul Retreat in 2 weeks time. Made using Candy Lane PP, printed chipboard. Nan's favourite stamps & sheets of plain chipboard. Sunset LO made using Seaside Collection PP, Journal tags & Printed Tickets. 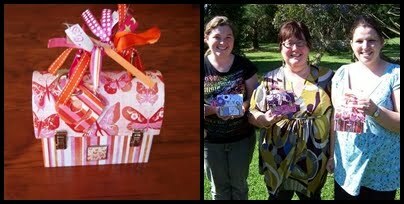 A collection of altered items made using Flutterby - a large vanity case, memo pad holder & wine bottle. Mini Lunch pail using Flutterby made during a home lesson and the girls after our lesson. A small selection of mini albums that I have created over the years. Advent Calendar made for Dragonfly Scrapbooks Retreat Class, November 2010. Cards made using Kaisercraft paper pads. These are so wonderful to make very easy to make simple but very beautiful cards. I added an embellishment or a stamp & I have cards ready to go. I often give sets of cards as gifts. A selection of projects I made in my role as Design team member for Scrap of Faith. Christmas canvas, Altered mirror, love monogram mini lunch pail & altered coffee tin with tiara mini album. 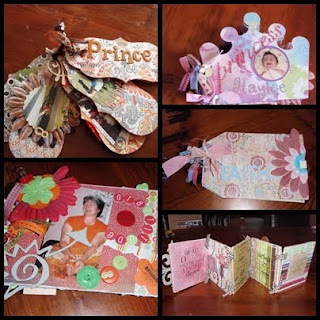 Our stories layered album using Dancing Jewel, designed for the 2009 Scrapping with Soul Retreat class. 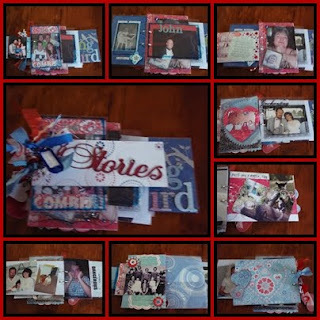 An alternative Our Stories Layered album using Lovestruck. Good luck and your "portfolio" will certainly be a winner. All lovely items and very creative. Best of luck with your application for the postition. Such lovely projects! Lots of luck! !